Guest blog from Creative Scene Director Nancy Barrett, attending the Tandem Europe partnership event in Athens with Heckmondwike art ambassador Simon Thirkill. I’m getting a little concerned. Simon’s flight arrived two hours ago and I’ve still not heard from him. I’m due to shepherd him to the hotel and then on to the Benaki Museum where we’re making our first public presentation of our project, ‘Taking Our Place’. Over the past 16 months, Creative Scene’s Producer Vicky has been part of a network of 25 young cultural producers selected to take part in Tandem Europe. The ‘Tandem’ is a partnership working together on creative solutions for social innovation. Vicky has been sharing the model of community commissioning that saw Simon bring a whole host of digital fun to the annual HeckmondLIGHT event. I get a call. Simon’s already arrived, checked into the hotel and is at the Museum ahead of me, so I get my skates on and head off too. 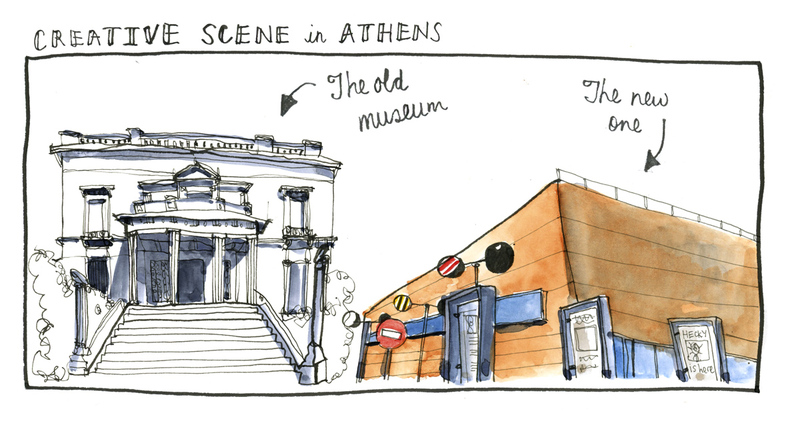 The Benaki is the oldest museum in Greece, now housed in a swanky new building. President Barack Obama, I read in the in-flight magazine, visited last month. Simon and Vicky are in the midst of a large crowd as a panel of the project organisers is quizzed, game-show style, about the Tandem programme. The host is a man dressed in a long curly wig and a woman dressed as a snail is making her way slowly around the room. We grab a glass of wine and settle into the merry throng. Soon, Simon and Vicky take up their place by their poster presentation and field questions about the project from the curious arty crowd. 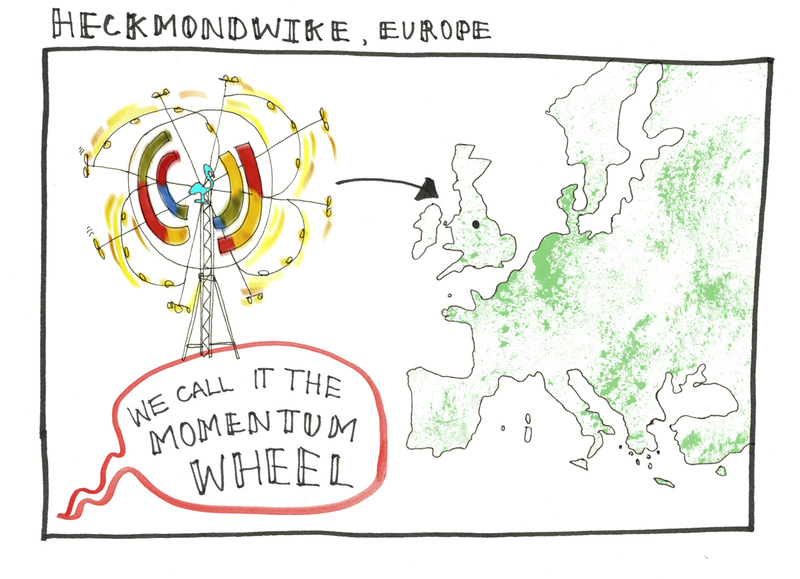 It’s good to hear the interest in how local people in North Kirklees are working as co-commissioners and producers with professional artists, and to see Heckmondwike take its place on the European map. Simon must be tired – he had an early start to make the flight to Athens – but you wouldn’t know it. He’s found other ‘light-art’ projects around the room, is sharing experiences with fellow enthusiasts, and making plans to visit.